Do you find your piano going sharp in the mid-section in winter? Do you find that 3 weeks after the weather changes to dry your piano has gone flat in the mid-section? Do you want to preserve the life of your piano for your children or grandchildren to enjoy? Do you want to enjoy the sound of your piano for the full year till it is tuned next? Piano Life Saver Systems help in the control of humidity changes. There is a safety zone of between 35 and 55 percent that pianos will stay stable in. However, in Perth and Western Australian country areas the humidity can range between 15 and 95 percent. Piano Life Saver Systems are made by Dampchasser in America and need to be fitted by an experienced piano technician with ARPT Accreditation. Why? Good question. The better the Piano Life Saver System is fitted the better it will work. ARPT Technicians have the experience to know what will happen to your piano when the Piano Life Saver System is fitted. At Piano Magic we can tell when is the best time for fitting the system to your piano. What type of system to fit? This is very important. We have different systems if your piano is over 50 years’ old. These systems are ordered and produced only for Piano Magic. We carry a full system with us when tuning. We have a full range of spare parts if your system has any sort of electronic failure. The system has a humidistat that measures the humidity inside the piano. 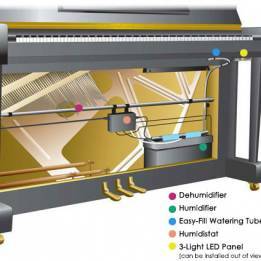 If the humidity is low the humidistat turns on the humidifier till the humidity raises to the correct level. Then if the humidity is too high it turns on the de-humidifier. It then continues to cycle 24 hours a day. Yes, you need to keep it plugged in and turned on to have continues protection. The system has a light to tell you it is plugged in, a light to warn you when the system needs water and a light to warn you that you have not filled it up and the whole system is dry. Or has not been maintained. How do I put water into the Piano Life Saver System? Good question. Down below is a picture description of how to fill the system. How much power does it use? In Perth it will use about $60 a year. In different environments it will change a little. How much water will it use and how often will I need to fill it up? Generally, the system will go for 2 too 3 weeks before needing more water however I have known systems to go for up to 6 weeks. This will depend on the type of air conditioning you have. Evaporative, longer between fill up. Reverse cycle about 2 weeks between fill up. What maintenance does a Piano Life Saver System need? Because the system works on evaporation to raise the humidity it is better to use water that done not leave a residue. If you use normal tap water, then the evaporation pads will need to be changed every 6 months as per instruction with the unit. These pads are available from Piano Magic. My preference is Rain Water. In my experience the pads only need to be changed once a year at tuning time if rain water is used. The same goes for distilled water. The best distilled water I have experienced is out of the clothes dryer that has a condenser. It is recommended to use a pad treatment that is supplied with the unit. One cap full with every top up of water. When tuning piano I have been recommending and selling Piano Life Saver Systems for over 5 years. I started selling about 2 a week and now in my tuning week I would tune and service at least 6 to 8 pianos with Piano Life Saver Systems fitted. I am still fitting about 2 per week. If I’m tuning in the middle of winter the pianos with the system are all on pitch. I’m not pitching down the piano. In the summer I’m not having to do pitch raises. This helps me and it saves you money. A normal pitch raise or pitch down can cost from $110 to $165 plus the cost of the tune. Call us now to book your fitting of your very own piano protection. A Piano Life Saver System fitted by Piano Magic.